People who have not read our post on this really ought to do so because in it we explain that although you obviously cannot tell a grieving six-year-old that his unbelieving father is now burning in hell forever, there are ways of consoling the boy without committing the mortal sins of heresy and scandal. With this latest Francis heresy incident in mind — it occurred shortly after the Hellgate scandal, by the way — we will now take a critical look at some of the outrageous ideas proposed by “Fr.” Bentz in the America article. 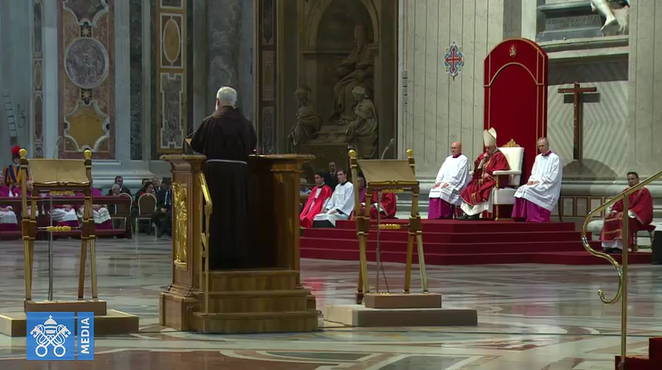 After explaining how he manfully burst into tears in public as he viewed video footage of the tenderness shown to little Emanuele, first by an assistant “priest” and then by the “Pope” himself, Bentz swoons: “Francis cuts through the distance between pope and child, between believer and unbeliever, and gets to the heart of the matter—human to human.” It’s incredible, isn’t it? Surely no one has ever been this compassionate before. Jorge Bergoglio, larger than life, has done it again: He embraces a child, the world holds its breath in awe, and Jesuits are weeping. Here we can see the author’s disdain for Sacred Theology and the true and certain knowledge that it produces. According to orthodox Catholic teaching, “it is the immediate and essential function of sacred theology to set forth and explain revealed teaching…” (Joseph C. Fenton, The Concept of Sacred Theology [Milwaukee, WI: Bruce Publishing, 1941], p. 12). Bentz acts as though God had never actually revealed to us who goes to Heaven and who goes to hell — not, of course, in terms of specific individuals but in terms of the requirements necessary for salvation, which are anything but “conjecture”. “In the assent of divine faith we accept with utter certitude a [revealed] truth which is not evident” (Fenton, Theology, p. 15; italics added; cf. Vatican I, Dogmatic Constitution Dei Filius, Ch. 2; Denz. 1785-1788). God’s positive supernatural revelation, communicated to us through the mediation of the Church, Bentz belittles as mere “human rules” and “limited understanding.” It is clear that we have a Modernist at work here. Although he does, in the sentence that follows, briefly pay lipservice to something his own sect has retained of the Catholic teaching about the impossibility of atheists going to Heaven, Mr. Bentz relativizes it as being nothing more than “our best guess and carefully thought out tradition.” In other words: God’s revealed truth is one thing; our understanding of it is quite another. All theology is ultimately nothing but a bunch of human ideas and opinions that are perhaps to be respected insofar as they come to us through a long and venerable tradition, but they ultimately do not give us any certain knowledge about supernatural truths. That this is basically the very idea condemned by Pope St. Pius X in his Syllabus of Modernist Errors, won’t bother the Jesuit much: “The dogmas the Church holds out as revealed are not truths which have fallen from heaven. They are an interpretation of religious facts which the human mind has acquired by laborious effort” (Pius X, Decree Lamentabili Sane, error no. 22). What would be the point of the Catholic Church if ultimately we could not know God’s message for mankind through her? This message “has been and … will be preached to the world with infallible correctness by that Catholic Church which is constituted as the Mystical Body of Christ” (Fenton, Theology, p. 14). Affirming this is not making an idol out of anything (Bentz echoes Francis in this regard), it is simply believing our Lord when He promised that the Holy Ghost would lead us into all truth (see Jn 14:16-18; Jn 16:13). That’s why Christ established a Church to begin with — a Church “not of heretics but the Holy Roman, Catholic, and Apostolic [Church] outside which we believe that no one is saved” (Pope Innocent III; Denz. 423). This Church is the very “pillar and ground of the truth” (1 Tim 3:15), as Scripture itself attests. It’s amazing that the very Novus Ordo Modernists who reject the objectivity and knowability of positive supernatural revelation under the specious pretext of “limited human understanding”, are nevertheless quite quick to find God revealing Himself in all sorts of natural ways. For example, ad nauseam we are told that God reveals Himself in the faces of the poor, in the running of a stream, or in the “concrete circumstances” of the wrecked life of an unwed post-abortive mother of three (cf. Antipope Francis, Encyclical Laudato Si’, n. 85; Exhortation Amoris Laetitia, n. 303; Exhortation Gaudete et Exsultate, nn. 43-44). Indeed, when it comes to this kind of revelation, we never hear about any “limited understanding” that might obscure what God is telling us. That’s reserved only for dogmas and doctrines proposed by the Church that Novus Ordo theologians seek to find a way around. Thus we see a two-pronged Modernist strategy to deny truth and generate error: First, downplay or deny outright the traditional Catholic teaching by claiming that although the Church may have proposed it for our belief, our understanding of it is necessarily limited because we are but human. Second, propose an error you find rooted in human experience, and then declare that it is God speaking to us, the God who became incarnate and therefore — so the specious reasoning goes — continues to reveal Himself in history, in our existential predicaments and the concrete situations of our daily lives: “The questions of our people, their suffering, their struggles, their dreams, their trials and their worries, all possess an interpretational value that we cannot ignore if we want to take the principle of the incarnation seriously” (Francis, Gaudete et Exsultate, n. 44). Thus, when “Fr.” Bentz demagogically declares in the same essay that “‘God is the one who says who goes to heaven,’ not the catechism. Not the pope, not you or me, but God”, he is denying the perfectly known truth that if Emanuele’s father died an atheist, he is most certainly in hell, for “without faith, it is impossible to please God” (Heb 11:6) and “he that believeth not shall be condemned” (Mk 16:16). To put it succinctly: God has already told us who goes to heaven and who goes to hell, at least generally; and we must assent to this revelation with divine Faith, the very theological virtue this Modernist author is trying to undermine. That a man who claims to be a priest of the Roman Catholic Church could pen such utter infantile trash defies belief. Then again, Bentz is a member of the Society of Jesus Judas and his lousy article is published in that Jesuit review America, so perhaps that explains it. Instead of providing to his readers serious argumentation from sound Catholic theology, Bentz prefers the way of silly and demagogic rhetoric, deliberately switching cause and effect to paint a caricature of how God separates the wheat from the chaff (cf. Mt 13:24-30). Obviously, God admits the just to Heaven and condemns the reprobate to hell, not because of what the Roman Catechism or even Sacred Scripture say. Rather, it is the other way around: Sacred Scripture and the Catechism teach what they teach because of what God has revealed. This isn’t difficult to grasp, and no doubt it hasn’t escaped Bentz either. Once again, we see a Modernist Jesuit busily trying to destroy the virtue of Faith in souls. Apparently Bentz has not understood anything about God, the Beatific Vision, original justice, original sin, justification, or grace; or if he has, he refuses to believe it. The reason why souls that are deprived of sanctifying grace — whether that be due to original sin or mortal sin or both — cannot see God is that enjoying the presence of God and seeing Him face to face in Heaven is intrinsically incompatible with sin: “There shall not enter into [Heaven] any thing defiled, or that worketh abomination or maketh a lie, but they that are written in the book of life of the Lamb” (Apoc 21:27). This is so, not simply because God arbitrarily decreed it (as though He could simply decree otherwise) but because it is intrinsically impossible for God to share His nature with those who are not regenerated through grace and on that account are at enmity with Him: “Amen, amen I say to thee, unless a man be born again of water and the Holy Ghost, he cannot enter into the kingdom of God” (Jn 3:5). “Fr.” Bentz evinces traits of Lutheranism, for he seems to believe that all that is required for salvation is for God to declare us just, without us actually being just. The condemnation of this heresy came not just from the Tridentine Council but also from the sacred lips of our Blessed Lord Himself: “For I tell you, that unless your justice abound more than that of the scribes and Pharisees, you shall not enter into the kingdom of heaven” (Mt 5:20). It is not difficult to understand that original sin has consequences. Not surprisingly, these consequences are denied by Modernists, who synthesize in their position various errors found in Pelagianism, Protestantism, Baianism, and Jansenism. Even in the state of original justice, the sanctifying grace Adam and Eve enjoyed was not due to their nature but had been freely bestowed upon them by God as an undeserved supernatural gift on top of their natural endowments (see Pope St. Pius V, Bull Ex Omnius Afflictionibus, errors nn. 23-24; Denz. 1023-1024). With the first sin, properly called original sin, Adam lost this gift for himself and for all his progeny (see Rom 5:12). Hence the need for a Redeemer who would provide the means of supernatural regeneration (cf. Gen 3:15); and hence the utter impossibility for anyone — babies or not — to enter Heaven who is not justified “through the laver of regeneration or a desire for it” (Trent, Session VI, Ch. 4; Denz. 796; cf. Vatican I, Dogmatic Constitution Dei Filius; Denz. 1808). It is evident that Bentz rejects these dogmatic teachings of the Church, although one may assume that he would never admit it if challenged directly. Now whilst they went to buy, the bridegroom came: and they that were ready, went in with him to the marriage, and the door was shut. But at last come also the other virgins, saying: Lord, Lord, open to us. But he answering said: Amen I say to you, I know you not. Watch ye therefore, because you know not the day nor the hour. If what We have said up to now concerns the protection and care of natural life, much more so must it concern the supernatural life, which the newly born receives with Baptism. In the present economy there is no other way to communicate that life to the child who has not attained the use of reason. Above all, the state of grace is absolutely necessary at the moment of death without it salvation and supernatural happiness—the beatific vision of God—are impossible. An act of love is sufficient for the adult to obtain sanctifying grace and to supply the lack of baptism; to the still unborn or newly born this way is not open. 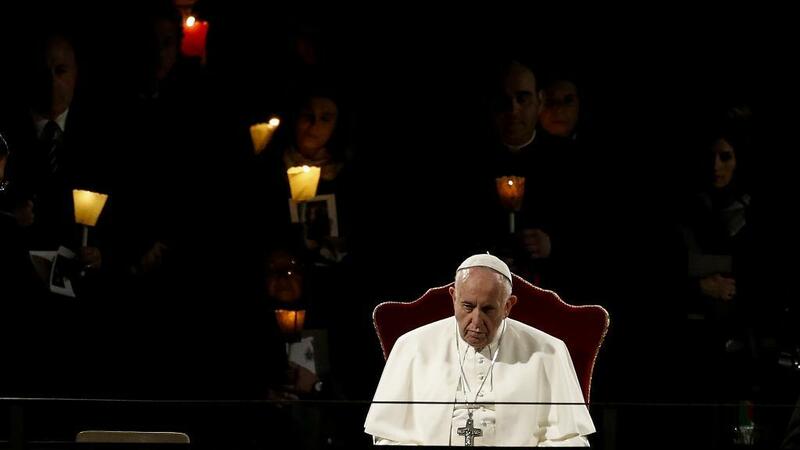 When it comes to the Catholic Faith, there is nothing left in the Vatican II Church. Jack Bentz’s article is sterling proof that Novus Ordo theology is finished. After having had free rein for roughly five decades, look at the junk it has produced. These people do not even believe the basics. If God does not intervene beforehand and put an end to it, the Vatican II Sect will eventually collapse under the weight of its own apostasy, stupidity, and irrelevance. May God hasten the day.